growing twins X 2: "Mommy, I didn't drown!" since it is spring break, we have spent a lot of time at the pool this week. yay, for living in a community with a pool. lincoln recently learned to swim, and colton and landon have known for some time now. before today, clayton thought every time he got in the pool he was close to drowning. he always told people, that he can't swim because he almost drowns. his story is that whoever is in the pool with him almost makes him drown. in case you are wondering, my story is that he has never come close to downing. today he watched as his three brothers were racing in the pool. clayton decided that he would be charge of saying, go!!! since of course, he might drown if he races. i knew that he really wanted to swim, but was so, so, afraid. finally he told me that he was ready to swim. his whole body was shaking with fear. he instructed me to take him inches away from the ladder and let go...so i did. 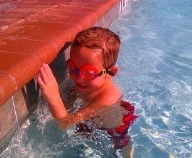 when he came up, he triumphantly announced, "mommy, i didn't drown! i can swim!" by the end of the day i was throwing him into the pool and he was swimming to get out. i am so proud of this little boy that got over his fear of swimming.